It's time for another challenge over at Frilly and Funkie. This time Nancy is the hostess and she has chosen the theme "BOUNTIFUL HARVEST". She would like you to create any vintage or shabby chic project celebrating the bounty of the season in the rich hues of Autumn. One lucky winner will receive a $25 gift certificate to Linda's shop The Funkie Junkie Boutique! See this sweet little squirrel beside the sentiment? It is actually a clip that was part of a package that my dear friend Anne of Redanne sent me. They are so adorable, I have attached one to my camera bag of course, one to my winter jacket and I used part of one to add to this card which will be going to my family. Just to remind them how important the little things in life really are!! 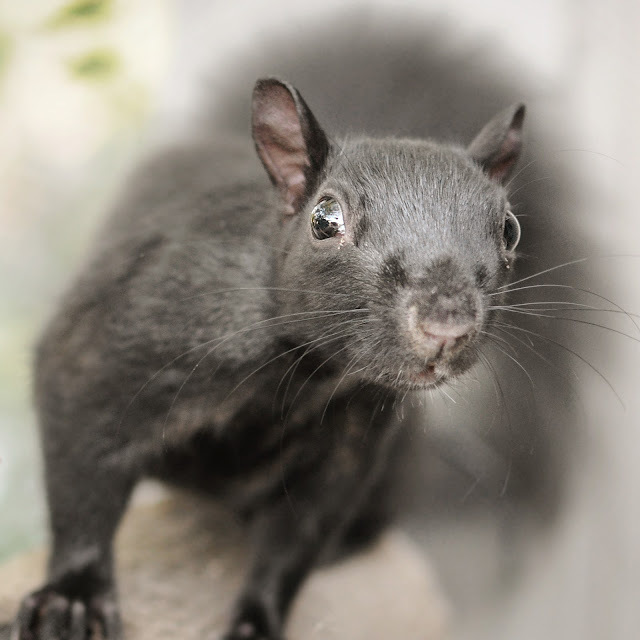 Thank you everyone for all your wishes for my missing squirrels. I haven't had any luck yet finding any of them, but my research indicates that many squirrels relocate naturally when the seasons change. My sweet MR SCRUFF has been missing for over a week now, and so with all my heart, I hope he has moved into his winter home and I will see him in the spring. Oh how I miss his little face. 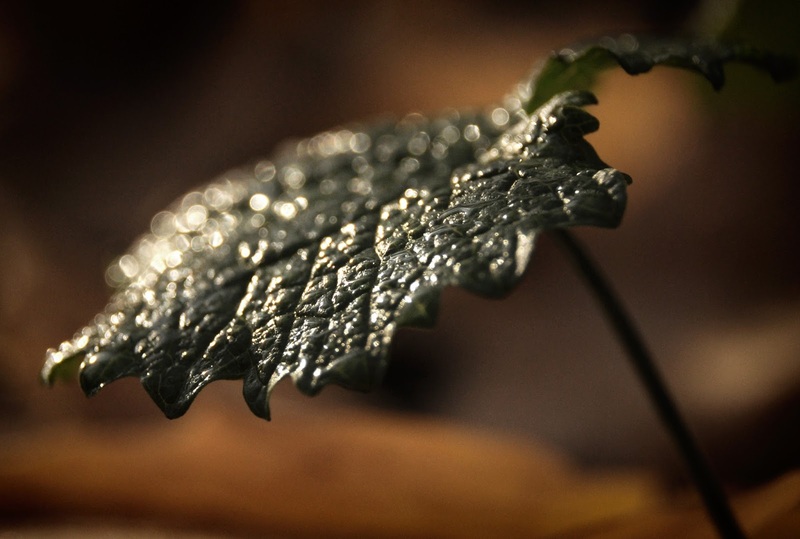 For my macro shot today, I have this very lonely green leaf in the early morning light. HENRY having a wee nib on what is nowadays, a very rare green leaf. OK ladies, you know the words, SING IT WITH ME!! "Because you know I'm all about the bass, bout the bass, no treble!" This photo is a couple weeks old, but I just can't resist sharing this little cutie pie enjoying her cookie! BON JOVI saying his thank you before darting up the tree to eat in peace. A male Cardinal coming out from the trees in all his bright red winter plumage! 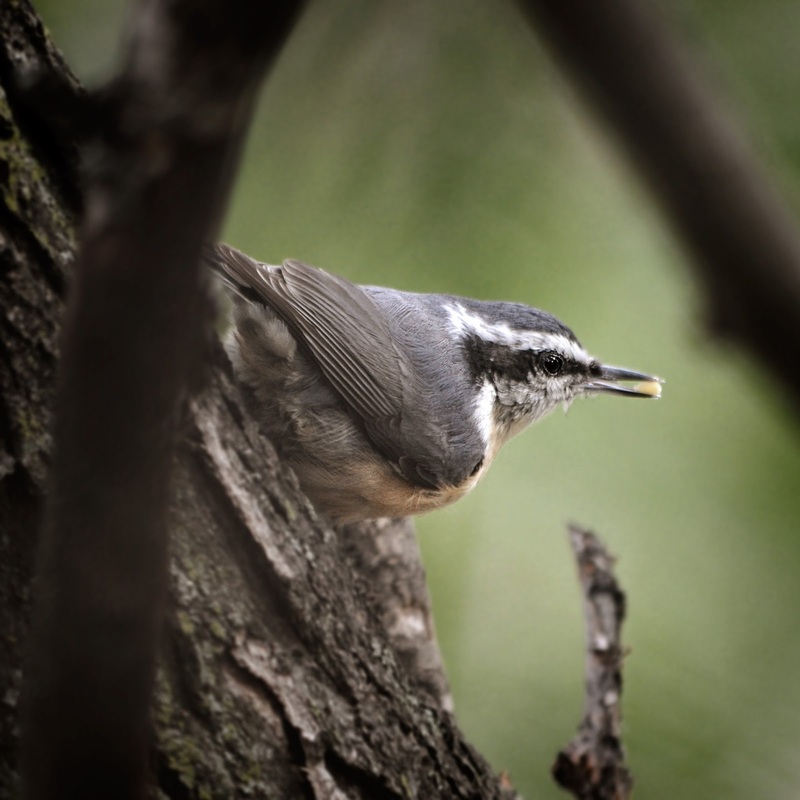 ... and my first Nuthatch sighting. One of our seasonal birds, and one of my absolute favourites!! I'm already working on making friends with these little beauties! MR SCRUFF checking out my camera lens while I was on my break in October. "Is there a peanut inside there? I can't think of any other reason for you to shove that thing in my face!" And my beautiful CRAZY KAREN, so gentle and sweet takes a treat from my hand and captures my heart once again. 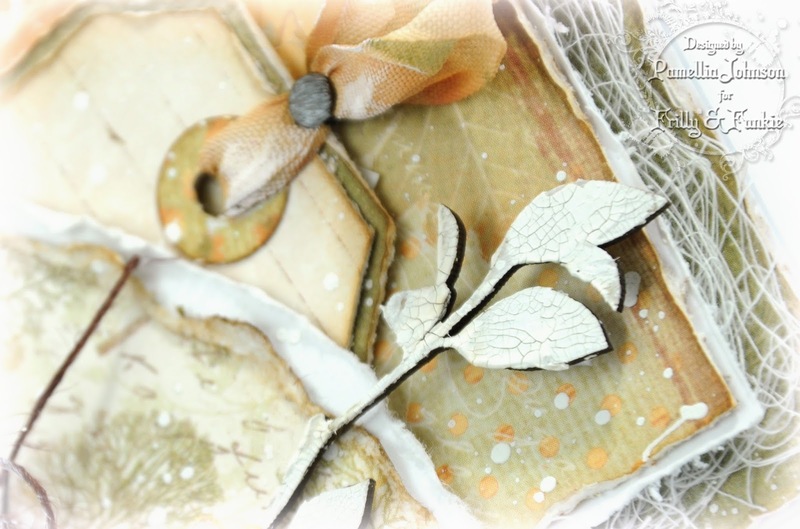 Stunning card Pamellia, so much detail to look at, gorgeous papers and embellishments. Oh Karen your card is another amazing creation - love your butterflies and owl, and that squirrel is so 'you'. Your photos leave me breathless with their clarity, and your cose ups of the animals are stunning. Sorry I have been MIA but we had family here over the weekend (7 extra's in the house) and we are making numerous trips out of town to the big 'base' hospital where all the specialists are as DH has a terminal cancer :-( on top of various other issues. This card is fantastically gorgeous! Fall without the strong orange and dark tones. I love it! Great photos, too. Stunning as always, love the beautiful Autumnal elements and design. As always. Fab pics and that squarely is getting chunkier with all your goodies you give them. It's a party to visit your blog! so much joy and wonderful photo's again! PS Love the photos too !!! 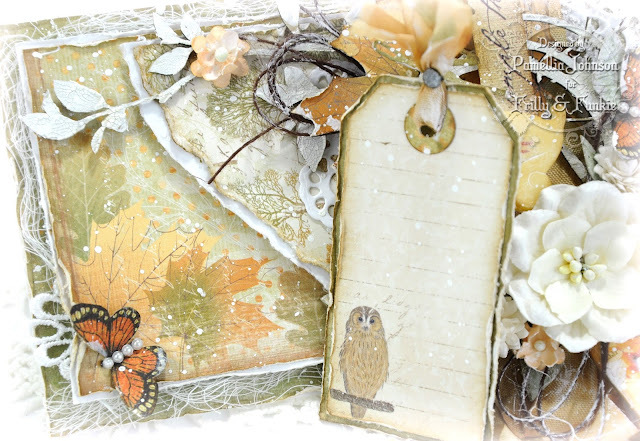 Your card is so beautiful with that amazing soft autumnal palette,remind me of the colours of an autumn morning when the mist is just lifting, Fabulous design and embellishments too...the little squirrel is a lovely addition. I do enjoy looking at your photos, the squirrels are so entertaining! Gorgeous card, as always, Pamellia! The squirrel pin is the perfect touch. I always love your furry friends photos. What a wonderful relationship you've formed with them. This beautiful card is a card that keeps on giving. I didn't see all the beautiful details until you showed the various pics with the little creatures peeking out at various angles. Fabulous shabby chic harvest! LOL!! 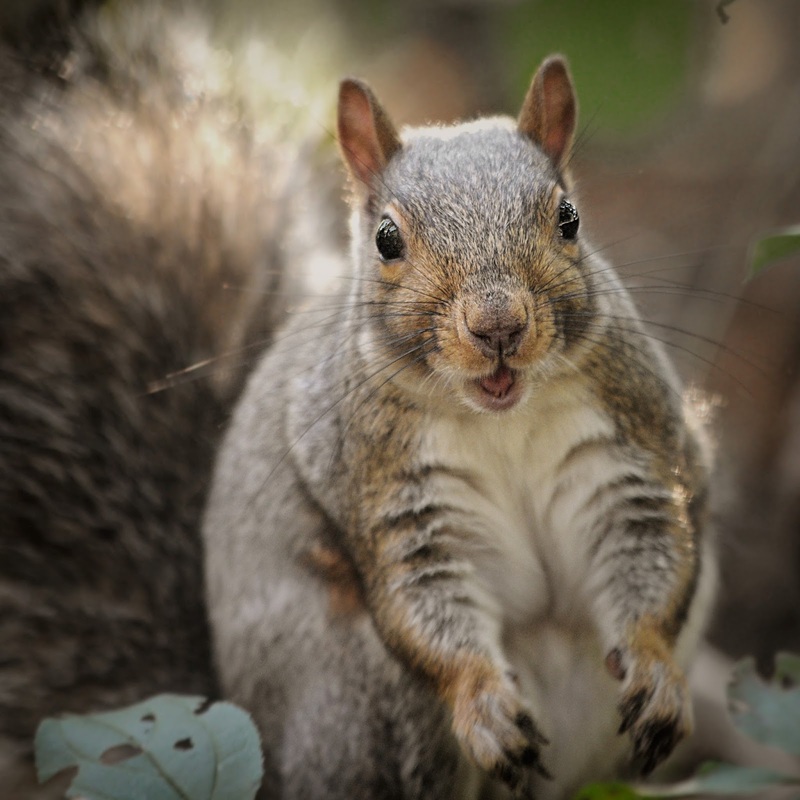 Your bass-loving squirrel looks like his name should be Fat Albert! LOL Don't you love the way his fur is "rippled" on both arms, Pamellia? Makes him almost look striped! The squirrels are all sweet, and remind us that the littlest are often the ones that do the most around us! I love the texture in your macro selection today. Such a SPLENDID fall into winter card. It makes me think that your "Shire" got a light dusting of snow over the fall harvest splendor! I remember last year you were a bit short of the snow though! Love the photos. So love seeing all your very special babies. Always makes my day. Xj. Veeeery beautiful, Pamellia! 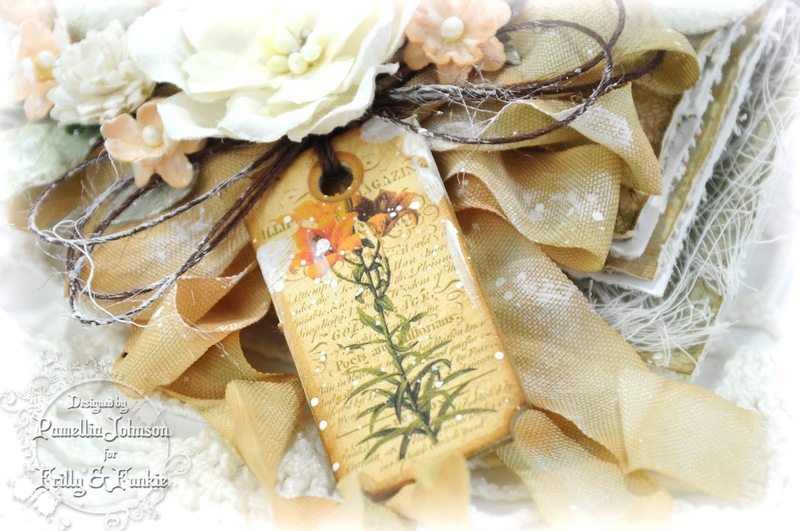 The tag AND the lovely photographs! TFS! That leaves background is just amazing with the owl peeking out, the butterflies and the little squirrel is a true delight!! Adorable distressed layers! Love also the tags added and all the leaves and the branches, the flowers... Fabulous, all just fabulous!! Wonderful photos, they always put a big smile in my face... Amazing, sweet, adorable creatures! They make life more beautiful!! Oh my good gravy, this card shoots up the list to one of my very favorites of yours, Pamellia!! Of course, I do think that about every card you make ;) I absolutely love how there are layers of goodness everywhere you look!! A cracked frame, an owl, the leaves, tag or an adorable squirrel...it's just endless amazingness!! I love, love every single detail!! Spectacular doesn't even begin to capture the beauty that is this card!! So stunning Pamellia..the beautiful colours and layers are devine and love your litte Squirrel embellie is just perfect..
Its a Beautiful tall card !! 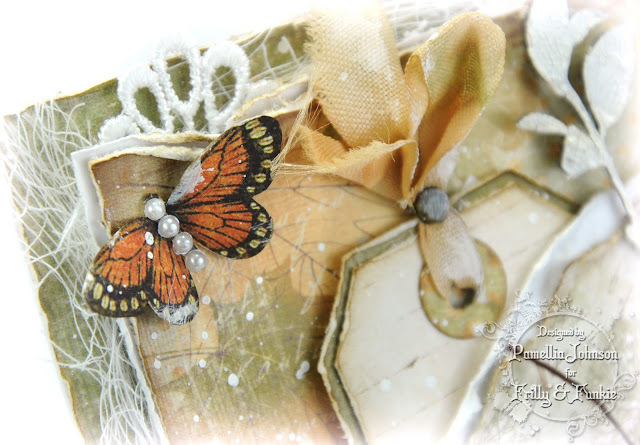 Gorgeous card Pamellia, love the layering, gorgeous embellishments and colours. Your photos are a joy to see. Another gorgeous creation today, love the sweet little owl and the beautiful butterflies - what a fantastic way to use the little squirrel too, he looks really cute! A gorgeous card again Pamellia, I think the folk you receive your cards will treasure them forever. 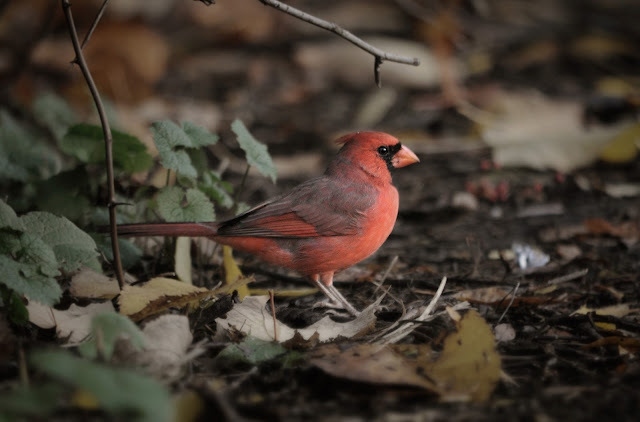 Super photos of the squirrels and birds, The Cardinal looks beautiful. 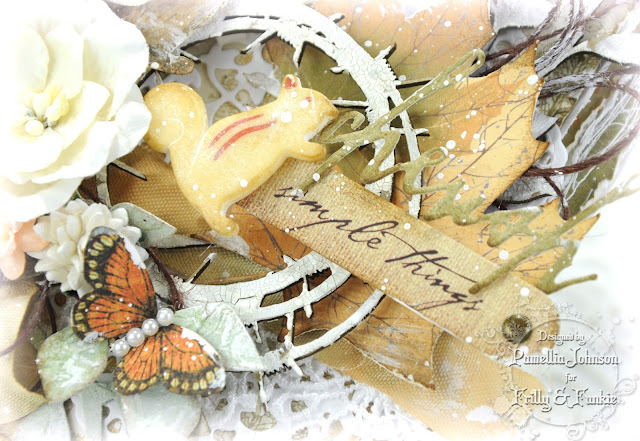 Stunning card and the little squirrel embellishment is so sweet. Another divine creation!! The delicate autumn colours, the spectacular layers, the cute little owl and that precious little squirrel .. totally delightful!! So many things to ooh! and aah! over and loving every little detail .. just magical. Gorgeous card! All the layers and embellies are wonderful. Fabulous photos too! 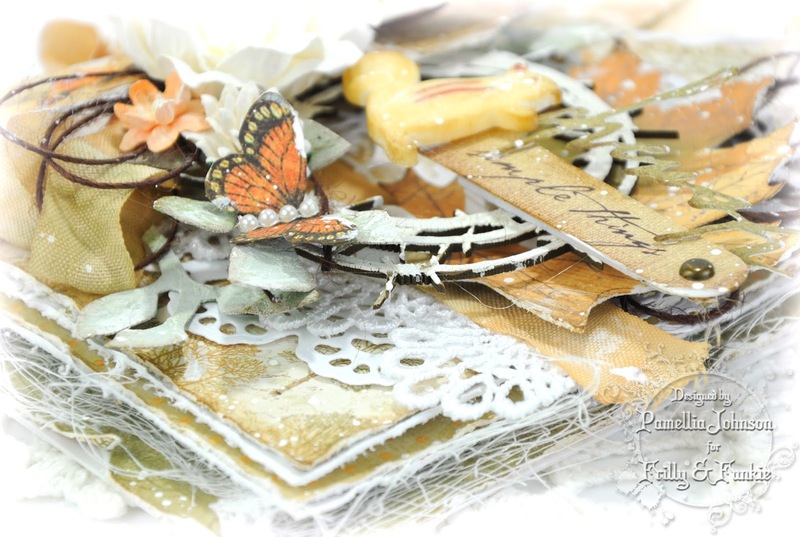 Another amazing layered card Pamellia, I love that it expresses Autumn bouty in all its glory, yet the colours are so soft and delicate! So many fantastic layers, the addition of the little squirel (and the owl too) are wonderful little touches. The photos are spectacular again too! Trés jolie carte! et trés jolies photos! So many gorgeous layers, and I love how they are all dusted with snow. That stripey little chipmunk is a show stealer...so very cute. I also love the owl tag and the whimsy of finding butterflies in the snow. Beautiful, Pamellia, but then your work always is! 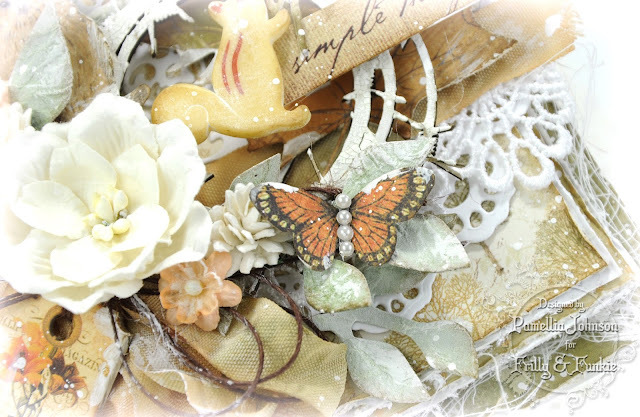 I love love love your autumnal creation ... Every detail is pure heaven! So sorry about your squirrels ... Our all vanished a few months ago so I don't know what has happened to them either... I miss seeing them. Pamellia, this may be the only blog I get to visit for the rest of the day, but now my day has been blessed! What beautiful layers and so many details...truly a 'bountiful harvest'! I love the tuck in tag, the owl, the squirrel (that Anne really hit your hot button with these clips! ), chippies and even a snow covered butterfly! Oh, how I could sink right into this card! Thank you for the amazing photos, too! 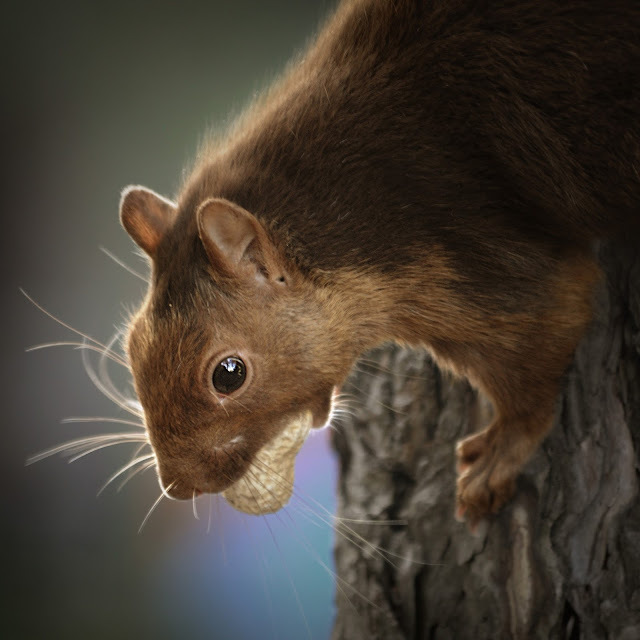 I really enjoy visiting with your squirrel friends and your macro and Henry shots are incredible! I'm running out of adjectives for your wonderful talents! Sending the biggest hug your way! Lost for words yet again with your so very beautiful card with so many gorgeous layers and your wonderful photos, love your friendly pals. sucha wonderful stunning and superb creation as usual. The colours are very pretty and all the superb elements you have used are awesome. 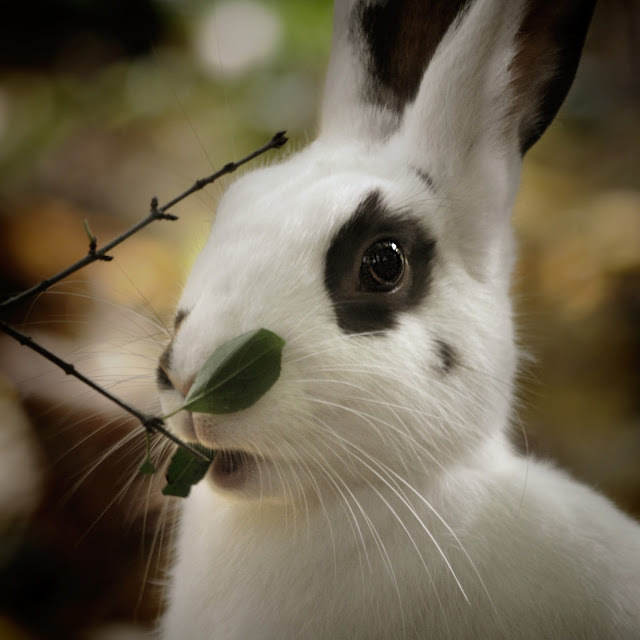 Great and wonderful phots of your animal friends. Thanks for the fun pic and have a great wknd! Your creations make every holiday and season so festive and magical!! 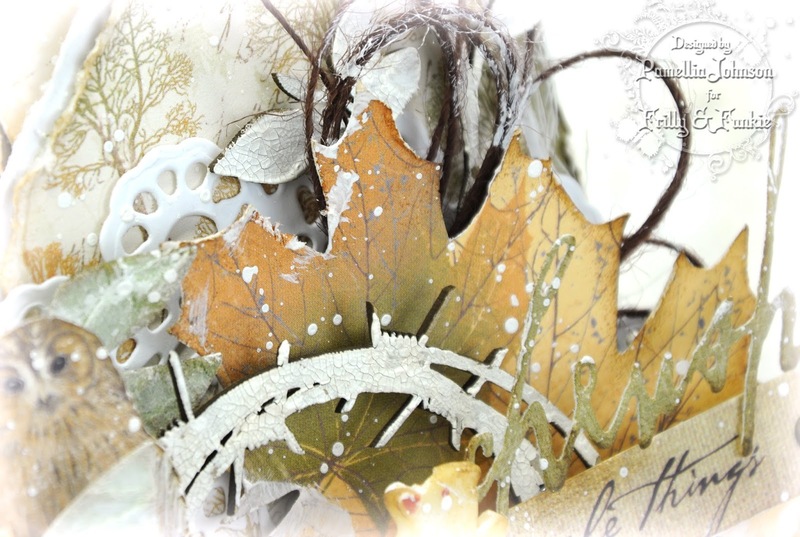 What a stunning autumnal card my dear friend, I can see all of those fallen leaves in your design - along with one of two of your woodland friends of course. A really gorgeous card. Once again a fabulous macro shot, you have an amazing talent. I love seeing all the photos of your woodland friends (although I have my favourites of course). By the way the cardinal looks great in his red plumage and the nuthatch is very sweet, I can see why it is one of your favourites. Wooooow, this is definitely my new favourite of yours, Pamellia! What a breathtakingly beautiful card this is! I would love to be in your super creative head for at least one day! 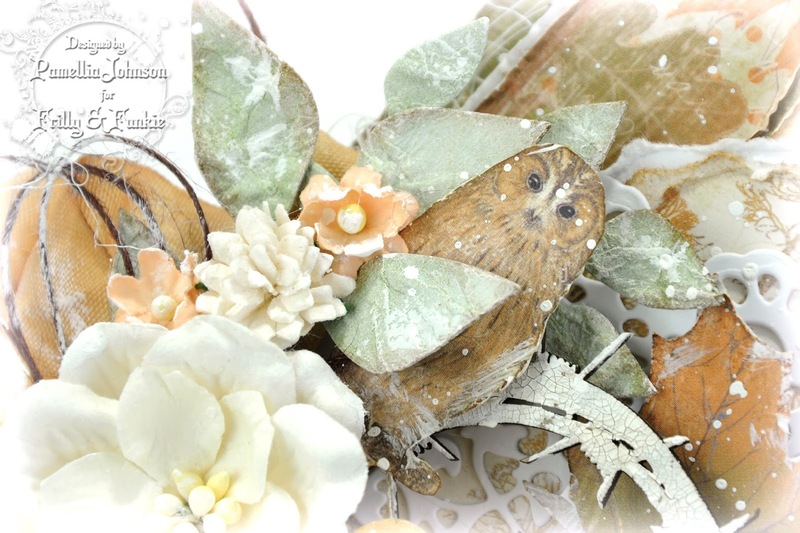 Spectacular layering, fabulous owl and that squirrel clip is awesome! Brilliantly done, as always, my friend! Thank you so much for the update about your furry babies! I am sure they are going to visit you again! Oooooh, how I love your photos! A real magic! Fantastic macro shot again! My favorite is a Cardinal shot because we don't have them here! Gorgeous fall card Pamellia! 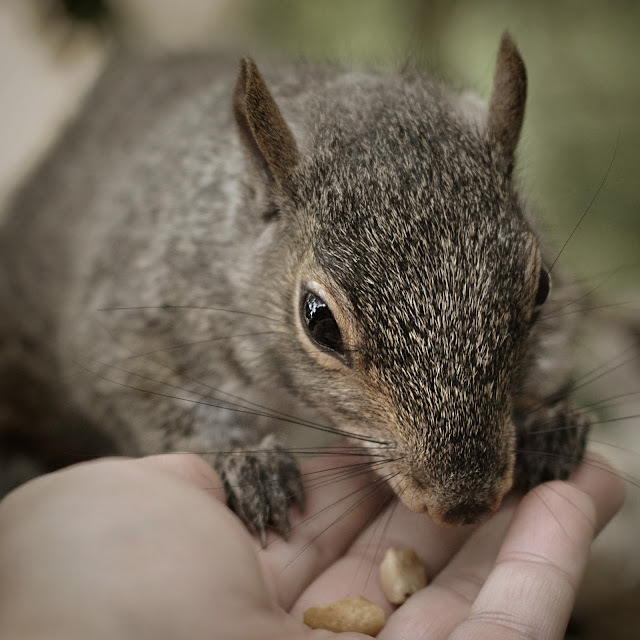 The little squirrel is a perfect touch knowing how much you love those little creatures! So many pretty layers on this card, simply marvelous work! Hahahaha! I am totally laughing about that song and now it is stuck in my head. The funny little zingers you come up with to accompany your pictures is great! Keep em comin dear Bubbles! Henry is becoming a regular! What a sweet little lad! And of course little Karen steals my heart as well. All of em do! Sorry I'm behind but not been so good again. Oh, to feel normal once more. Anyhoo, gorgeous card. Looks like someone has gathered up a bunch of Autumn and popped it on a card. Don't lose heart with the squirrels. The family that used to visit our garden just disappeared all in one go so I prefer to think they've just found another spot to visit. I've been by your blog at least three times to check out your gorgeous card, and every time I got so caught up in the photos I forgot to leave a comment. Honestly, everything that comes out of your craft room is a work of art. Seriously. This card is such a brilliant, Frilly take on the challenge theme. It's layer after layer of beautiful autumnal elegance. And you know how much I love your tiny squirrel:-)) My son was home from college for the weekend and made a comment about the adorability of the squirrels at our feeders. I showed him your wildlife photos and he was beyond impressed. He got quite the chuckle over Bon Jovi-lol. I believe it's your gentle spirit that brings these normally skittish creatures right up to you. It's visible in your art work as well as your stunning photos of the creatures in The Shire! Just had a lovely catch up, this is a lovely subtle Autumn card, love it. Wonderful photos, I do love the squirrels.